The title might lead you to believe that this has been the most interesting day of the trip so far. 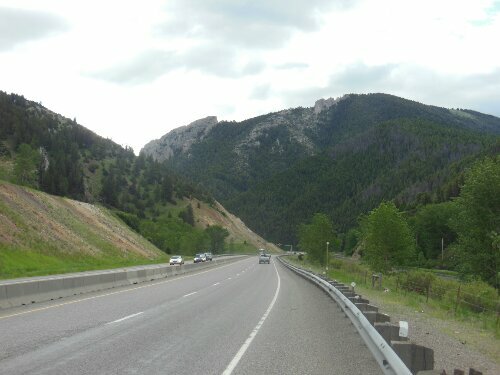 Leaving from Billings, I took Old Highway 312 through the small towns of Huntley and Worden. Stopped at a small grocery store for some fruit and a can of chilli, waved to a few people at the gas station, and went back on my way. About 1/3 of the way through the day, while at a rest area, ominous, dark clouds began approaching from the west. I proceeded to check my phone radar and confirmed my suspicion that it was going to rain. 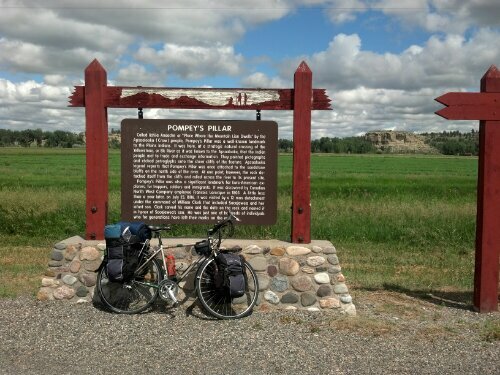 I hopped on my bike and pedaled 9 miles to the small town of Custer. At the gas station, I was notified of the covered park shelter a few blocks down. The park was very nice. It even offered electrical outlets and an extension cord to charge my phone at the picnic tables sheltered from the wind and rain. The cafe at the top of the hill just east of Custer provided an astoundingly affordable and delicious fish sandwich and chips. A local park ranger eating at the place gave me some information on places to camp for the next few miles, but I wanted to make it farther. The Hysham hills were a terrible surprise. I figured the hills were over long ago, but these rather steep slopes proved the landscape still didn’t lay flat. I made it over them somewhat easily and decided to carry on after passing Hysham. Forsyth was my new goal for the day. 10 miles from Forsyth, disaster struck. The second flat of the day happened just as it began to get dark. That was okay, I would just change it and still make it to town at a reasonable time, for I was moving at a pretty good pace. At the semi-dark 10:00 p.m. hour, my new inner tube was filled, tire in place, and my gear was getting packed in the panniers, when a surprising Pop! sprang from my tire. The tire, the one that I had folded in my bag for 2 weeks, likely wasn’t set on the rim properly. It was forced out of the rim from the pressure, putting stress on the inner tube and causing it to blow. Optimistically, I reached into my bike bag for another inner tube only to realize that was the last one. If cyclists have a nightmare that doesn’t involve crashing, it is either this or running out of water. I began walking in the dark at 10:30 or so. After 2 miles, the mountain lions came out to play. Hearing them less than a mile, probably only a half mile away, really started to make me nervous. I ended up flagging down a car at about 11:00. They were the nicest people. They called the local deputy and I would get a ride to town. They also offered me a place to stay for the night. The ride in the front seat of the Rosebud County squad car was much nicer than the back seat I figured. The deputy that gave me a ride ended up taking down the info for my blog and for the orphanage website. He dropped me off right at the host’s house with my bike. I was ready for a good night’s sleep. Yep. You read that right folks. 143 miles today. I didn’t anticipate making it this far at the beginning of the day, but helpful tailwinds for the first couple hours of the morning and early afternoon really helped my cause. 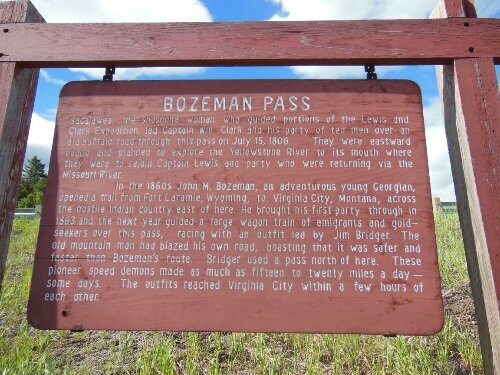 Bozeman Pass was the first obstacle of the day. Not too hard, but a steady climb for sure. On my way down from the pass, severe crosswinds blew over a fifth-wheel and a truck into the ditch. In Livingston I stopped at a small bike shop for a little tune-up, and they said those blowovers are pretty common. After eating at Gil’s Goods, just a few blocks down from the Timber Trails bike shop, I was ready to rock and my bike was ready to roll. Due to construction, I took Old Clyde Park road out of town. 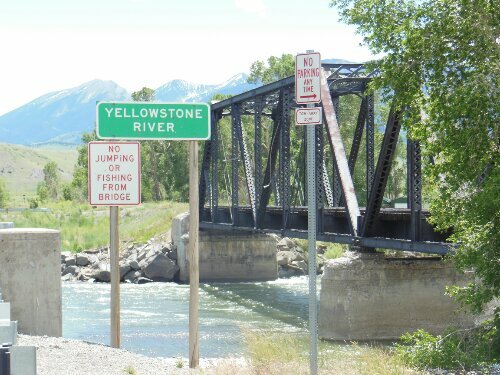 And, before reaching the interstate, had a nasty encounter with the forceful wind as I biked south across the Yellowstone River. The wind pushed me along. Mile after mile. 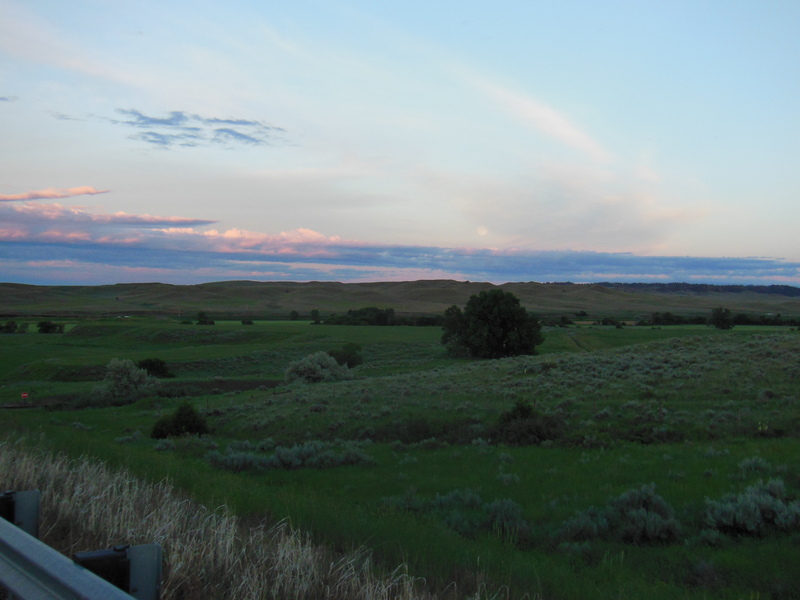 Across the high desert of central-eastern Montana I went. In Columbus, surprised at the rate I was cycling, I was able to find a host in Billings, still a little ways to go, and it was starting to get late. After the sunset, two flat tires, and 143 miles, Rambow (my bike) pulled into the driveway of my hosts. I was greeted warmly and offered a shower and food. Ended the day sitting around a campfire with the hosts and a fellow cyclist who was staying with the same hosts as well.